Is buying replica WW1 medals a bad thing? I am very much struggling to locate the whereabouts of all my ancestors WW1 medals and this is partly due to not being able to find living ancestors. I've scoured everywhere on the internet and for all I know they could no longer exist at all. This is quite a sorry state of affairs and I shall never give up looking for living ancestors or the medals themselves, but I would like to ask if the buying of replica WW1 medals would be a bad thing? 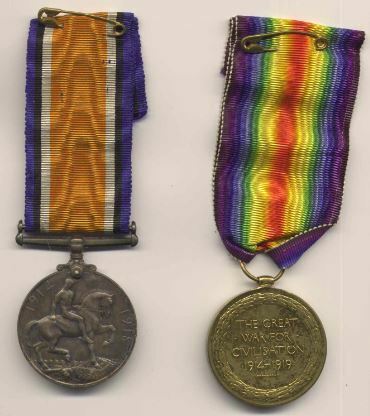 Is there any noticeable difference between a replica WW1 medal and the original artifact? I'm a very proud person and just me knowing that they are replicas is a totally bad thing, but I feel that this is going to be the only route for me to have proof of my ancestors achievements during WW1. Let me know what you think folks! I struggled with a similar problem on a reduced scale, I only needed a 'pair', but I didn't want something named to someone else. After a long time I located an unnamed pair and I was satisfied with that. Its really a personal choice. 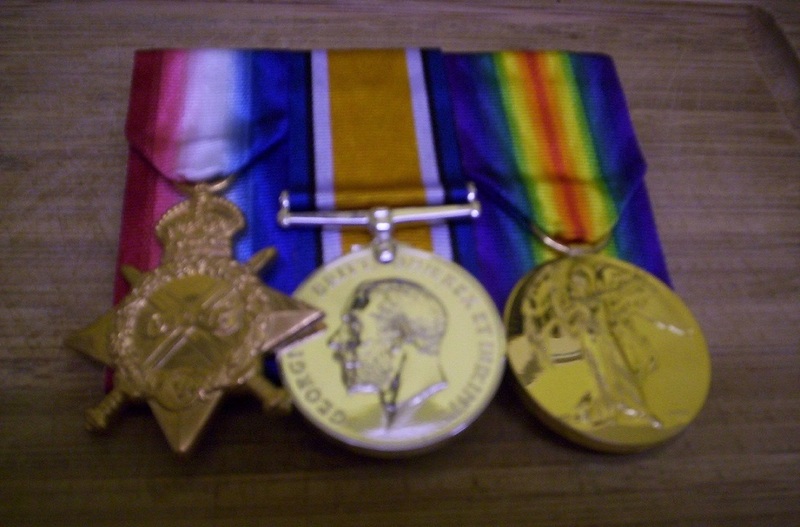 I'm currently looking for a trio set of 1915 Star, Victory & British War Medals that are unnamed, but struggling. I see a lot of replicas that have the word 'aged' attached and this puts me off straight away, does the word 'aged' mean that they cannot be polished up? I needed a MC to fill out a display. No way I could afford an original so I bought a copy. I think cost around $20US including mailing from Britain to the States. Lee, if you can't realistically expect to find the originals, get the replica set. We have both - the originals are stored away and have tatty ribbons, rusty safety pins and faded engraving. Remember, they were usually stored carelessly, played with by all the children and handed down in an envelope in a box. Buy the replicas and display them with pride! I agree. there is nothing wrong with replicas. The medals are a representation of the sacrifice your family member made, and while I think getting unmarked period ones would be better (for me) they are obviously much harder to get. Replica medals don't at all diminish the memory, in fact, having them displayed might keep the memory alive. As a collector of medals, why not tell us what you are looking for, as in, name, service number, unit. You never know. Replica's aren't too bad, just don't buy medals that have been erased. This gives them an excuse to erase more. With original ribbon, as mentioned above, and a nice frame, it would be hard to tell the difference from a distance. As for the hunt for family medals, I think we are all in the same boat. I obtained on behalf of an old lady a few years ago a trio (replicas), (also an original French Croix de Guerre as her relative saved a French officer on the battlefield) and she was more than happy with them. Ralph. Medals that have been erased really bother me, they were issued to someone and to erase their name is just morally wrong. I see erased medals as worse than replicas. I don't personally have any medals to any family members other than my fathers Korean War medals, I have no urge to find any of the medals and if they ever turn up what a bonus it would be. I feel that this is going to be the only route for me to have proof of my ancestors achievements during WW1. There are plenty of unloved medals out there and when you have identified the unit in which your relative served the purchase of medals belonging to another man, who served in the same unit is a very real possibility. This is how many people start medal collecting. I guess you may not want to take it to this extreme but when it comes to replica medals there are many varying qualities of product. You will pay more for die struck copies and less for cast. If you want to purchase a copy as authenticate as can be, then view those sales listings for die struck copies only. Also be mindful that some cheaper copies are plated. That plate can be removed, with over zealous polishing. Can anyone recommend a quality source for replicas? Jeremy Tenniswood Militaria of Colchester (see Militaria.co.uk) has a good selection of di-struck copy medals (with are marked copy to avoid any confusion). If required he offers other services, such as medal mounting for display or wear. He also sells the real thing. I can testify, I have used Jeremy on many occasions. I purchased a plated copy of a Zulu war medal (South Africa) from him for a framed display, the detail of the die used was exceptional, as well as the overall finish. Jeremy is a good man and if you have any questions he will have the time to discuss them with you over the phone. He is always very helpful when I have contacted him. Interests:The Great War, obviously. Choral music. Aviation history. Genealogy. Another option is miniature medals. 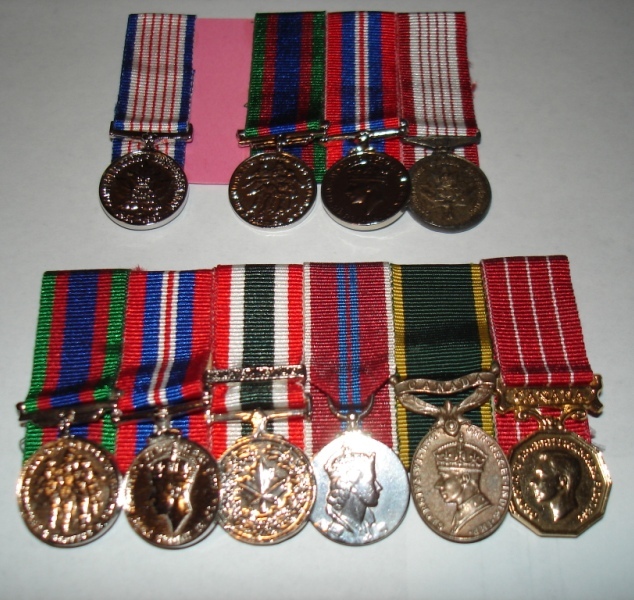 These groups represent my aunt's 1992 125 Anniversary of Confederation, and her brother's CVSM, WM, and Centennial Medal, and below my Uncle Bill Hamilton's group I have the originals, but as worn his group lacked the SSM (awarded after his death), and the Efficiency Medal which shows on his records. My aunt's medal had disappeared when she died in 2001, and her brother's medals are with his daughter. YES! My WW1 replica medals arrived today! Very proud to have found out so much about my ancestors and what they did during WW1, many thanks to everyone who has and still is helping lead the way in always remembering them! Just a few more months to find out my Grand Uncles medal entitlement for WW2... Fingers crossed! Not a very good image because my camera is ancient, but they look great! They look good, I've been considering replicas as my grandfathers medals were lost when my grandparents home was destroyed in the blitz, in fact the Luftwaffe seemed to have it in for them as they were bombed out twice! I've just purchased an original pair to a soldier who served in the Warwicks to commemorate my Great Uncle who died and my Grandfather who survived. After researching the soldier I found that he was born in the same year as my Grandfather and lived a few streets away in 1911! The price was not much more than buying replicas. Now I have them mounted and commemorate three soldiers. Very well said. I could not agree more. After a fruitless search for my Great Grandfather's Tank Corps 15 trio, I decided to order a replica set which I mounted and framed behind non-reflective glass, along with an old photo and some ephemera. Yes, you can tell the difference between replicas and originals. But we collectors look at them all the time, and it becomes second nature to spot the fakes! Don't forget that not everyone is a medal expert, and very few people who see the medals displayed will notice any difference. I find that the slightly opaque nature of non-reflective glass disguises the subtleties giving a nice appearance. Framing also reduces the need to opt for impressed naming. To anyone who comes to the house and sees this display on the wall, the talking point is always the man, not the medal group. I would like to think that these men would be proud to have their memory living on after 100 years. Long may that continue. Ninth nine % of those who will care to even take a look at these original or repro medals will not know what they are looking at. On the back the mounting board mark on an index card, stating that these trio of medals was possible lost by or pasted onto another family member. I am the proud grandson of ……….. and this is his story. I never really tried looking for my granddad's medals because he ended up with the Tank Corps in 1918-19, and I quickly discovered that even though he did not see active service with them (he was posted to one of the light tank units being made ready for 1919), medals for those with a TC connection attracted a neat and pricey premium. Well, I guess that one day I might start to look for them but I have already accepted that replicas will do the job until I strike lucky! I choose not to buy replicas. For the simple reason that I posses two Family unmounted Casualty Trios,excluding Clasps. The fact that they are "correct medals" is immaterial to me.I've inherited them.How do I know they are original?They may have been pawned in the poor 20's and redeemed? The fact that I posses "original "unmounted medals is immaterial to me.I know they are" correct" but am happy to have them "examined" by a Forum Medal expert..
,The Trios are unmounted,having them mounted or remaining as they are will not in any way bring me closer to what my my WW1 Family saw or did. There are different standards of replica medals, I have a wonderful replica trio that is mounted for wear, aside from the obvious fact they are unnamed you would have to look extremely close up to tell they are not original. As in life you do get what you pay for, I bought mine from a reputable dealer as a tribute to my Great Uncle whose medals were forfeited (shot at dawn). I have many original groups... but if you are buying replicas, spend the extra pennies to avoid being disappointed and have them mounted.